Who says you can't have productive fun while waiting in the car? The day before yesterday I was running errands with a friend in Hutchinson, Kansas, when it began to snow. After shooting snowflakes last month, I tend to be really excited when I see those crystals falling from on high, so I looked closely at the front car window and saw these jewels. The engine was no longer running and the outside temperature was in the upper teens, but these flakes on the side window still began to melt. This shot is a full size detail from a frame shot at ISO 100 in the Canon SX10is set at the super macro setting, which must be used at this distance. Unfortunately, the super macro setting locks the camera at its widest focal length so even though you can press the lens right up against the window, the snow flakes were still a small part of the field, necessitating the full size. 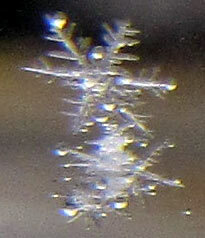 At least the flat side window enabled me to get the lens closer to the snowflake. This one was more off-center in the frame and not as sharp. I keep several pieces of black plastic and cloth in my freezer now, awaiting their use as non-melting landing areas for backyard snowflakes.